The second annual Claflin C.A.R.E. Bike Ride will be Aug. 1 in New Haven. Proceeds from the event will go to help needy children at Christmas. Pictured above is a scene from a previous bike event in the Bend Area. NEW HAVEN — Unseasonably cooler temperatures this season might not be conducive to some summer activities, but are perfect for a bike ride with a good cause. The second annual Claflin C.A.R.E. Bike Ride will be Saturday, Aug. 1, at the New Haven Ball Fields/Bachtel United Methodist Church. Proceeds will go to the Bend Area C.A.R.E. Christmas Assistance Program. 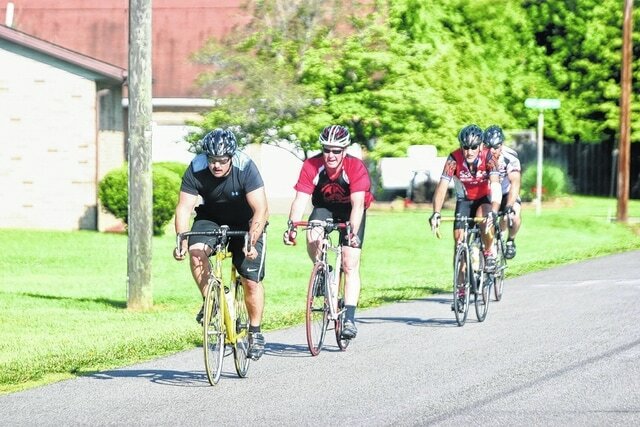 Unlike a bicycle race, the riding format will be multiple laps around an 8.5-mile loop, according to Jodie Roush, organizer of the ride and member of the Bend Area Sprocket Spinners bike club. The entire family can join in on the event because there will be turn-around points at various locations for those unable to go the entire distance. Roush noted the multiple lap format allows riders to travel at their own pace without being left behind. Last year’s inaugural event drew 29 riders who completed 109 laps, for an average of 32 miles per rider. Check-in begins at 7:30 a.m., and riders may begin any time between 8 and 11 a.m. All riders are expected to finish by noon. The ride will begin at the ball fields, proceed to Midway Drive, then left onto Rt. 62 to the Sporn plant. From there, bikers will turn onto Broad Run Road, Gun Club Road, back onto Rt. 62 to Layne Street, and finally back to Midway Drive. Snacks and drinks will be provided at the start/finish area. At noon, there will be a free cookout for all participants. Even though the event is not considered a race, there will be novelty awards presented in several categories, including most laps completed and others. There will be patrol workers stationed along the course for any assistance riders might need. Helmets are highly recommended, Roush said, and are required for riders under 16 years. Children under 16 must also be accompanied by an adult. Registration for the bike ride is $20 for each participant. Checks, made payable to Bend Area C.A.R.E., can be mailed to Jodie T. Roush, 5017 Charleston Road, Point Pleasant, WV 25550. Registration forms are available at www.tristateracer.com. The first 40 people to register will receive a free t-shirt. Money for the initial cost of the ride was provided through a grant from the Robert and Louise Claflin Foundation. Funds raised from the ride will be used by Bend Area C.A.R.E.’s Christmas program, which usually serves more than 80 needy children. Approximately $12,000 is spent by the group annually for gifts and treats. For more information on the race, contact Roush at 304-593-4446.